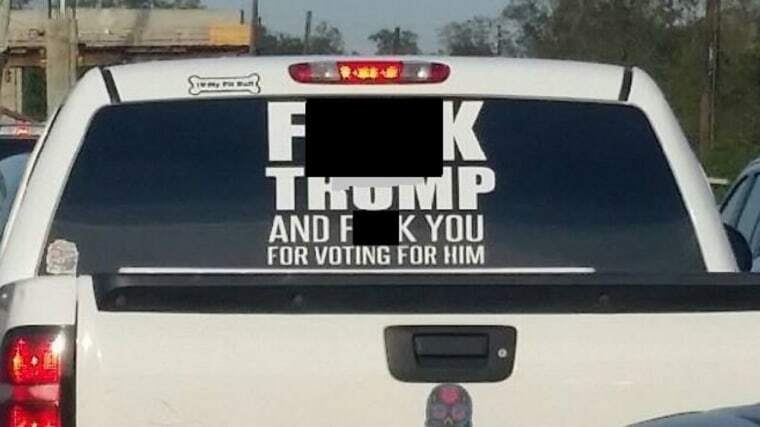 A Texas woman who was arrested after a sheriff threatened her with criminal charges over a “F--- Trump” decal is considering filing a federal lawsuit, her lawyer said Monday. Attorney Brian Middleton said that Karen Forsenca, 46, may pursue a civil rights lawsuit against Fort Bend County Sheriff Troy Nehls for violating Forsenca's First Amendment rights. "This is not illegal," Middleton said. "This is protected speech." “If you know who owns this truck or [if] it is yours, I would like to discuss it with you,” he wrote on November 15. “Our prosecutor has informed us she would accept disorderly conduct charges regarding [the decal], but I feel we could come to an agreement regarding a modification to it," Nehls wrote in the post. On November 16, the sheriff’s office arrested Forsenca on a fraud warrant over an incident that Middleton said occurred three years ago. He declined to discuss the case, though he described Nehls’ pursuit of Forsenca as a publicity stunt for an upcoming congressional race. Nehls formed an exploratory committee in February to consider a run in Texas’ 22nd Congressional District. Nehls’ post went viral, and the sheriff’s office was alerted to Fonseca’s warrant, he said. “This warrant was served in a professional manner and without publicity on the part of the Sheriff’s Office,” he said, adding that the public recognition he believed Forsenca was seeking through her sticker did not cause a grand jury to indict her in August for fraud. Nehls was hopeful that he and Forsenca could come up with a solution that satisfied her constitutional rights while respecting the rights of parents and others who found the sticker offensive, the statement said. “I am now quite aware that no such hope for a calm and reasonable discussion exists with her,” he said.